From February 4 to 10 the World Surf League "Las Americas Pro" returns to the island. Last year Ruben Vitoria Basque and Australian Mikaela Greene claimed titles in this competition. Passing through iconic locations, such as the Teno Rural Park or the Teide National Park, the Vuelta al Teide Cycle Tour takes place on March 30. The main route consists of 160 kilometers, with a total ascent of almost 4,000 meters of altitude. The Half Teide is the other modality of the event, with 90 kilometers of route and 2,000 meters of altitude. The quintessential trekking festival in Tenerife, it combines some of the best trails on the island with local traditions, culture and cuisine, with tours of such emblematic places as Anaga or El Teide. This year's edition will be held from May 21 to 25 and Puerto de la Cruz will once again be the meeting point for all those passionate about nature and its trails. From level zero to 3,555 meters of altitude. The Tenerife Bluetrail is the highest test in Spain and second in Europe. Its more than 100 kilometers in its Ultra Trail mode represent a real challenge for all its participants. More than 2,000 signed up for the Bluetrail challenge in 2018. This year it will be held on June 8 and registrations are already open. El Médano is an ideal place to practice windsurfing, which makes it one of the most privileged circuits of the PWA world championship, which will visit us again in the second half of August. As well as the sporting events are workshops and courses. In October 2019, athletes seeking a challenge among millenary forests are in luck because Santa Cruz Extreme is celebrated in Tenerife. This race runs through the Anaga Rural Park, leaving from the beach of Las Teresitas and entering laurisilva landscapes. The challenge has up to three modes for all abilities. One of the best known sporting events at an international level in Tenerife, after its fifth edition managed to gather 4,000 registrations from among 60 different nationalities. 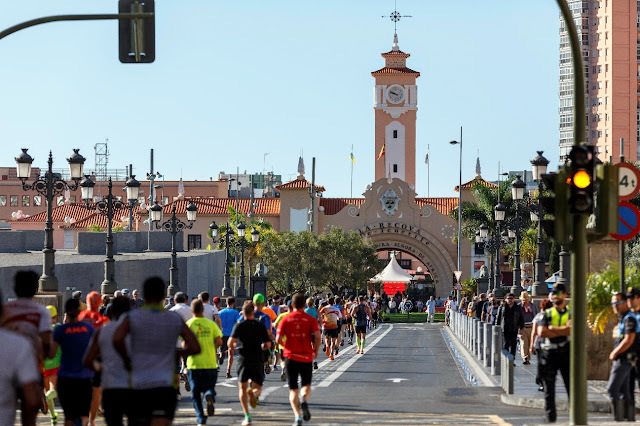 This urban race runs through the main streets of the Tenerife capital, becoming a great festive event. It will be one of the last of the year, on November 10.